As more people rushed to the entrance to secure a spot in the gym, the feel of a playoff game grew stronger and stronger. With their seven game win streak snapped in Quebec City Wednesday night, Concordia was able to turn the tables Saturday and pull away with a 90-74 win—on an afternoon where the third quarter made all the difference. 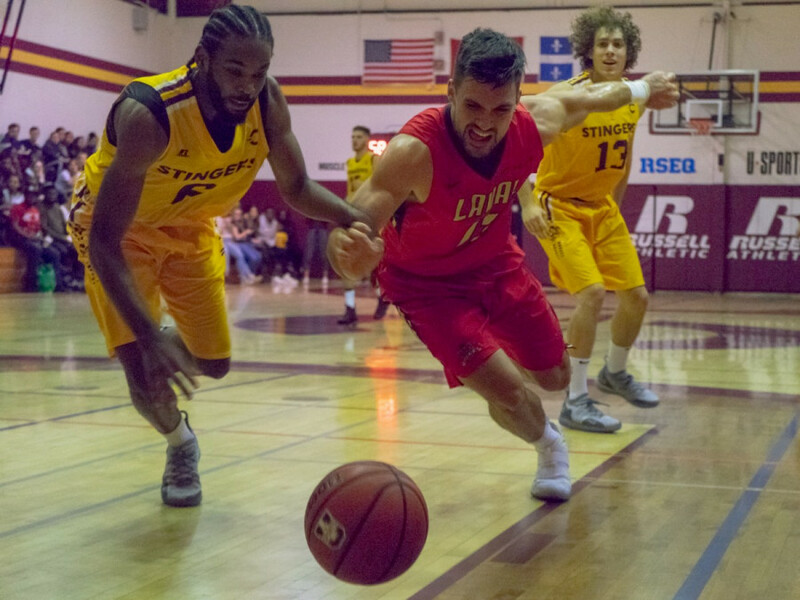 Down 55-41 with under six minutes left in the third quarter on Wednesday, Laval managed to claw their way back into the game and sting Concordia; closing the half on a 36-19 run that ended in a 77-74 win. Saturday afternoon, it seemed like they were still thriving off that momentum. Outscoring the Stingers 24-23 in the first quarter, Laval looked determined to pull off another upset, which would’ve pushed their win streak to five games. Concordia however, had other plans. As the game progressed, it became that much more difficult to predict a winner. With 11 lead changes and a total of 12 moments where the score was tied, momentum shifted Concordia’s way when fifth year senior Garry Merisier—who finished with a double double (ten rebounds and 16 points)—nailed a buzzer beating jumper that not only gave his team a 46-43 lead but an even stronger finish to the half. For coach Popovic, this is what creates separation in a tight game. Heading into the third quarter, though the chess match continued, Concordia held the lead longer and finally crushed the Rouge et Or for good when Adrian Armstrong broke his defender down, drove down the lane then spun around to find a wide open six-foot-seven Forward Aleks Simeunovic who buried a three-pointer, once again, at the buzzer to end the quarter. That play, amongst many others, lifted Stingers fans to their feet as the home side led 69-62, which left coach Rastko Popovic complementing his teams effort. Following the late bomb by Simeunovic, the Rouge et Or defence seemed unfocused and disoriented. At the beginning of the 4th, Laval record three turnovers in two minutes. Then at the 7:12 min mark, Concordia’s Aleks Simeunovic, showed once more his long range scoring ability when he confidently launched another highlight three pointer a couple feet behind the line with a defender all over him. The lead stretched to 12 and the Stingers never looked back. Three point specialist Armstrong praised his teammate after the game for scoring timely buckets. Despite coming off a tough ACL injury, Simeunovic’s mental toughness has never been greater as he made it clear how much his support system means to him. With five regular season games left, Concordia remain front runners to lock up top spot in the league as they are now (9-2). While the win gives them the tiebreaker against Laval, home court advantage has proven to be a deciding factor between both teams this season. The Stingers will look to break that trend on Feb. 21 when they travel back to Quebec City to play their final game of the season.